We are now used to notice a multitude of “without” and “with no” on cold cuts packaging: without sugar, fats, salt, colorants, artificial flavoring, palm oil and so on. Moreover in the last years the number of consumers asking for alternatives for nitrites and nitrates has increased, having a propensity for “more natural” food and a fear for nitrites being cancer-causing. Nitrites have an antimicrobial and antiseptic function, especially against botulin. Moreover they allow stabilization of the red shade of meat. 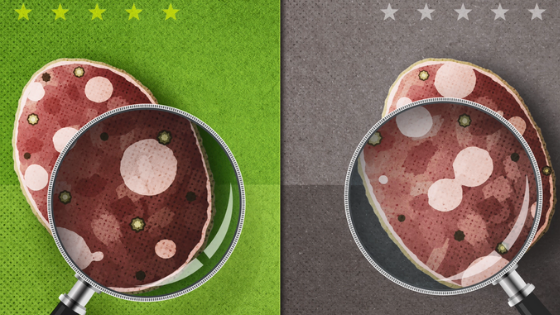 Even if the industry managed to find solutions in order to substitute nitrites with valid alternatives in cured cold cuts, it is not the same for cooked charcuterie as prosciutto cotto and mortadella, which need a little amount of nitrites in order to be consumed as established by the law. The growing demand has led several charcuterie producers to replace nitrites with plant extracts based on spinach and celery, which naturally contain a high quantity of nitrites and nitrates. However this solution does not change the chemical composition of cured meats, where nitrites and nitrates are still absolutely present. The use of the extracts of these herbs allows producers to avoid indicating the addition of “artificial” nitrites, thus ensuring a significant commercial advantage. At the end of November the Committee on Plants, Animals, Food and Feed of the European Commission, after the request of some member states, reiterated that the use of these herbal extracts which are naturally rich in preservatives, antioxidants, stabilizers, etc. must be considered as intentional addition of food additives. Consequently, plant extracts must comply with the additives regulation and must be indicated on the label as all other substances grouped in this category. The rules, as the Committee emphasizes, also apply when the substance has the dual function of flavoring and additive. So producers will no longer be able to indicate extracts generically as “natural flavors” and claim to sell products with no additives. Convinced that it is coherent to produce organic charcuterie without using preservatives, we from Pedrazzoli abolished the use of nitrites and nitrates in the cured meat products of our PrimaVera line in year 1996. As far as cooked products like mortadella and prosciutto cotto are concerned, we still use a very little percentage of nitrite. We firmly believe that the healthiness of a product should be guaranteed to the customer until the moment of use, and there is currently no other way except nitrites in order to do that. We consider it equally important to indicate the inclusion of preservatives on the label even if it comes indirectly, through elements that may contain them. It is a matter of respect towards the customer. We can also guarantee that the use of nitrite in PrimaVera products is widely under the organic regulation standard, and so is the residue in the finished product, which stands at around 25 mg per kg (organic regulation allows a residue amount up to 50 mg).